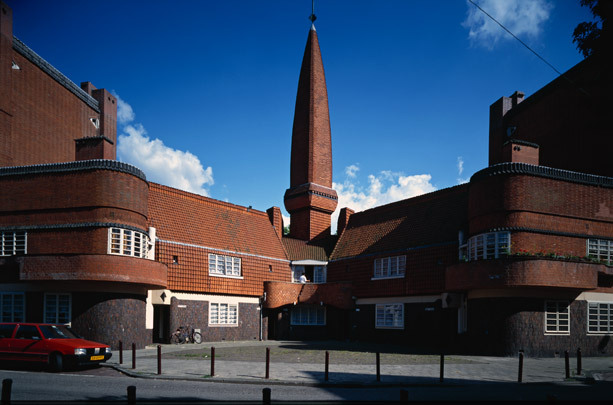 The crowning glory of Amsterdam School architecture, Eigen Haard consists of three blocks of housing in the Spaarndammer quarter. The first, on the north side of the public gardens (Spaarndammerplantsoen), was built between 1913 and 1915 for the contractor Klaas Hille. The remaining two were taken over by the housing association Eigen Haard (Our Hearth). The original intention was to build all three round the public gardens. After the south block had been positioned there (1915-1916) the third block was given a new, triangular site overlooking the railway line. This block, soon nicknamed 'Het Schip' (The Ship), was built between 1917 and 1920 and apart from the school on Oostzaanstraat is entirely the work of De Klerk. His Expressionist style, quietly active in the first two blocks, is here fully unleashed. A staggering variety of form and a sense of detail evidencing consummate craftsmanship raise each part of the block to a sculpture in its own right without in any way weakening the whole. Organized symmetrically, the block is in five storeys except at its lower southern end, where a cylinder marks the entrance to the post office. Long, horizontally accentuated facades along Zaanstraat and parts of Oostzaanstraat have been kept relatively taut and less busy. Facades on Hembrugstraat are similarly less-tall but then in the middle and set back to create a small triangular square dominated by a tapering tower. A narrow portal next to the post office gives access to an inner court, where a narrow path wedged between gardens terminates in a meeting hall. The great variety of brickwork joints and the extraordinary woodwork command respect for those bricklayers and carpenters who built these workers' dwellings. After De Klerk's early death in 1923 a tenant wrote in a letter to the daily newspaper Het Volk (The People) the following: 'He has departed, the builder of our houses. How shall we workers' wives remember this unflagging workman for what he has done for our husbands and children? It is as if every brick calls out: Come all workers, and rest from your labours in the homes that await you. Is not the Spaarndammerplein a fairy tale dreamt of as a child, as something we children never had?' Besides admiration there was plenty of criticism too. Government and bourgeoisie found the dwellings too luxurious and the architecture too exuberant. From later functionalists came a more fundamental criticism. Behind their attractive facades the dwellings, often building contractors' standard designs, had been given a decidedly rough deal. Most decorations and the tower served no purpose whatsoever. There was criticism, too, of the none too consistent treatment of the block and its special facilities, such as the post office and school. Restored in 1999-2001, the post office now hosts a museum (Museum Het Schip). One dwelling elsewhere in the block has been fitted out as a museum house. Examples of Amsterdam School street furniture assemble in front of the post office.